My generation was one of the last to grow up on a diet of Popeye cartoons and canned spinach. We’d dutifully watch Popeye eat his spinach so he could be strong; and then our parents would pile canned spinach onto our plates, believing we’d magically like it simply because we watched Popeye eat it. When I became older, I realized that it wasn’t spinach that I didn’t like. It was “canned” spinach which was the problem. As a general rule, canned vegetables are less appealing because the process necessary for canning makes the vegetables lose their vibrant color and natural vegetable smells and gives them a softer texture and a tinny taste. There are valuable socio-economic reasons for canned vegetables, though, so I’m not here to knock canned vegetables. I am, however, saying that if you were a child of certain generations you may find that you actually like particular vegetables you never have before if they are freshly prepared as opposed to canned. Spinach is one of those leafy greens which is not only quite high in necessary nutrients your body needs but it is extremely versatile. As well, if you still find that you’re not all that fond of the taste of spinach, even in it’s fresher form, spinach is easily disguised. There are basically two general types of spinach, a thicker, more rippled variety and a smoother, flatter variety with hybrids of every variation in between. For folks who have may have some concerns about their spinach liking, I’d advise trying baby spinach first. Picked at a younger stage, baby spinach is more tender and slightly “sweeter”. A common mistake folks make with spinach is overcooking it. Whether you boil, steam, saute, grill or broil spinach, you should always remove the spinach as soon as it begins to wilt. If you do so, the spinach will continue cooking from the residual heat and be at the perfect texture. If you let the spinach continue to cook until it’s entirely wilted, then when you remove it from the heat, it will continue to cook and become overdone. Another mistake is that folks forget that fresh spinach will cook down to a fraction of the volume. 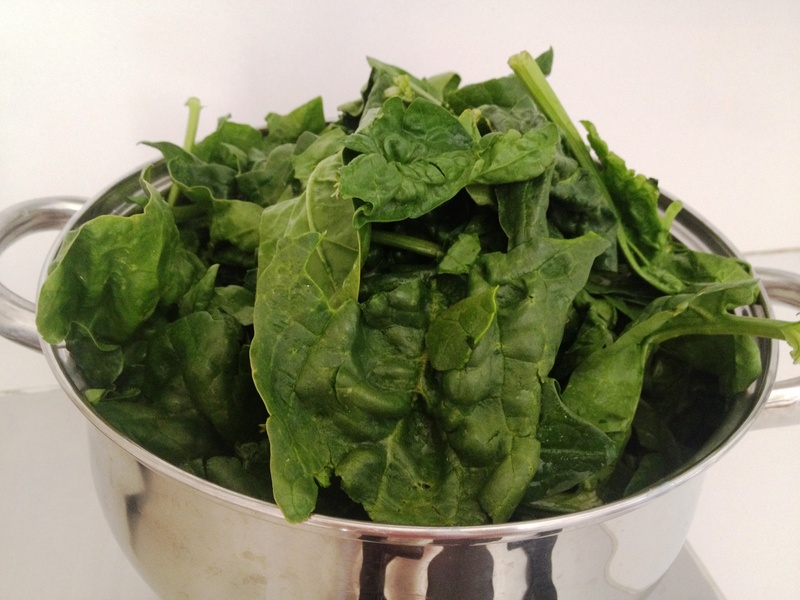 A pound of fresh spinach will yield about a cup of cooked spinach. So, if you’re using a recipe that calls for cooked spinach, you need to make sure to purchase the appropriate corresponding fresh amount. A cost-saving tip: If you are simply adding spinach as part of a cooked dish, like a soup or a lasagna or a frittata, go ahead and use frozen chopped spinach. It’s cheaper and just as nutritionally beneficial. Frozen spinach has also already been “cooked” so you don’t need to do anything to it, other than add it straight to your recipe. 1. Fresh in salads: Adding fresh spinach to a salad bumps the nutritional value of your salad and adds another dimension of taste. You can also make straight spinach salads. My children like to mix arugula and spinach, top it with roasted chicken and strawberries, and drizzle with a little bit of balsamic vinegar. 2. Additions to a main dish: You add flavor, texture, and nutrients if you add chopped spinach to just about anything you already make: lasagna, frittata, soup, seafood cakes, hamburgers, pasta salad, casseroles, bean dishes, etc…. There is no limit to what you can add spinach to. I especially like spinach on a pizza. 3. In desserts: Adding vegetables to desserts not only increases the nutritional value, but they tend to make moister desserts which also have a depth of flavor you don’t get without them. Pureed spinach can be used in cakes, cupcakes, brownies, puddings, etc…. Nowadays many recipes with spinach can even be found online, so you won’t even have to create your own. 4. Additions to dips and sauces: Spinach adds texture and flavor to any dip, salsa, or sauce. If you have a white sauce you really like, turn it into a spinach white sauce. If you have a sour cream dip recipe you like to make, add spinach. If there’s a salsa recipe you enjoy, add spinach. You’ll be surprised at how much you’ll actually like these with spinach in them. 5. To boost smoothies: Smoothies are the popular thing now. Adding spinach to whatever type you’re making adds nutrients which you wouldn’t get just from a fruit smoothie. 6. Simply as is: Sauteed spinach is a wonderful side dish to a meal, and what’s really great is that you can create any flavor combination you want for sauteed spinach. You can saute spinach with a little bit of olive oil and garlic. You can saute spinach with sesame oil, ginger, and soy sauce. You can saute spinach with curry powder and butter. You can saute spinach with mustard seeds and chili peppers. You can saute spinach with other veggies like mushrooms or carrots or onions. Your creative cooking imagination can really kick into gear as you experiment to see what tastes you prefer.